Okay, so I’ve not exactly got a horses mane of hair… Yet. And I don’t believe that some people will ever get to that luscious bum length head of hair, but there are a few hair growth tips and tricks you can follow to make the most of the hair you have. Some people have thick hair, some have thin hair, some will grow fast and some will grow slow. My hair is relatively thick, but just doesn’t seem to grow past shoulder length. Since properly maintaining it though, I have seen a growth spurt going on which has meant I’ve had to dye my roots twice in the last 6-8 weeks(!?). I used to manage around 2 months before my hair needed re-touching. But it seems my roots are coming through at least an each every 3 weeks right now. Which is a little bit bizarre. Apart from finally taking hairdressers advice and getting my hair trimmed more regularly (I’m now going for twice a year rather than one, but hey, that’s progress right?). Having your hair cut more often doesn’t actually make your hair grow faster (like myths pretend), but it just ensures the lengths are the best condition they can be so split ends don’t break off. I’ve also been upping my fitness routine by going to regular PIYO Classes and attending the gym as often as I can. Working out not only reduces stress, which can impact hair loss, but it also gets your body working like magic to increase blood flow and stimulate your scalp, which further helps your hair to come out of your head in the best possible condition it can! Every time I get back in to my gym game, I always notice my roots growing through quicker. I did go cold turkey on heat styling tools for many years and saw the condition of my hair improve drastically, but after wearing hair extensions for so long it got me back on to hair curlers and straighteners. I mean, I didn’t even blow dry my hair this time 3 years ago, but now I’m obsessed. Investing in good quality heat protection products has been a life (hair) saver though! There must be something in these formulas which have been helping, because I’ve never noticed such quick hair growth before. I’ve now come to the bottom of the bottle though so seriously considering buying more. 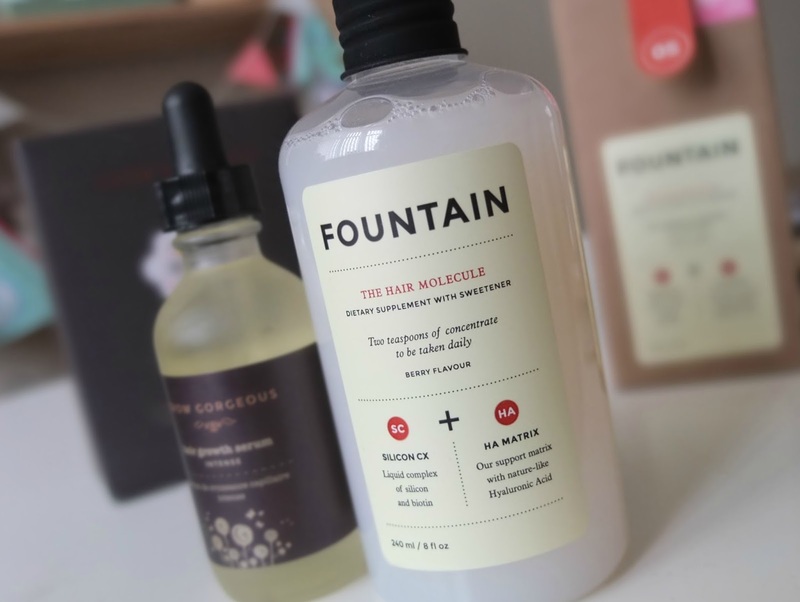 It doesn’t come in cheap though and the Fountain Molecules can set you back anything from £20 a bottle. But it’s probably worth the investment if you need a growth spurt of the hair kind. 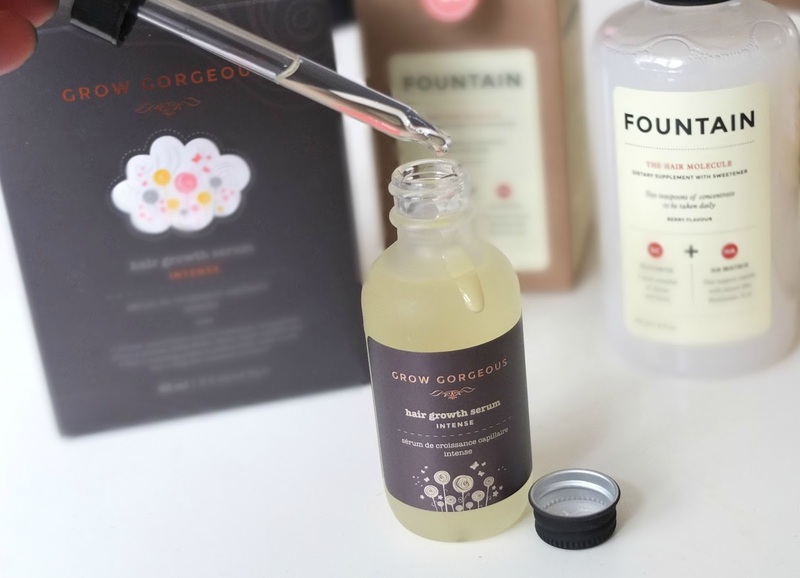 The Grow Gorgeous Serum is still over half way full, and I’ve found the easiest way to apply this is by dripping it on the end of your fingers and massaging in to your head that way.